One Saturday at work I had C-Span 2’s BookTv on in the background. 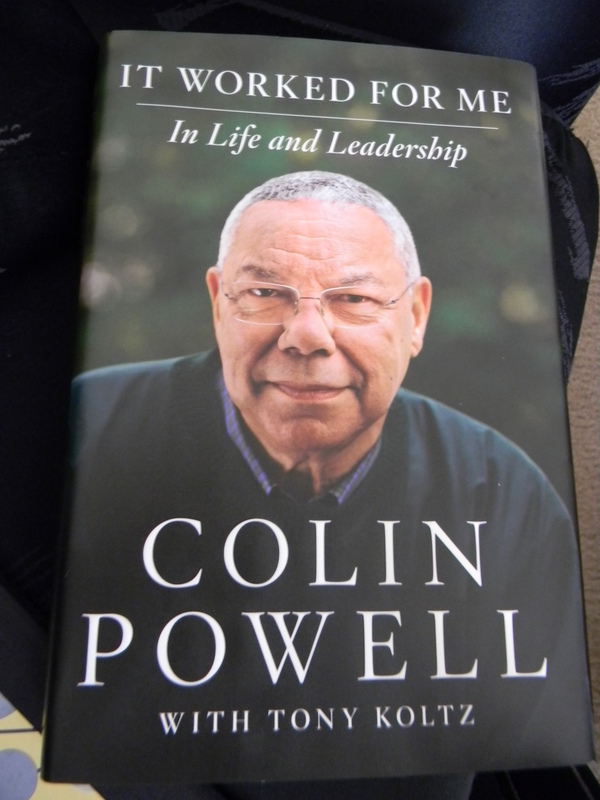 One of the top-selling books they mentioned that week was It Worked for Me by General Colin Powell. Having enjoyed his book My American Journey I made my way to Barnes and Noble and picked it up (yes I read printed books and go to brick and mortar bookstores to buy them). It Worked for Me is a leadership book born of Powell’s personal experience both in and outside the public sector. His leadership rules of the road, boiled down to “the 13 rules” which started as scribbles on bits of paper throughout Powell’s career and became the foundation of this book. Here’s a sample of the 13: #2 Get mad, then get over it; #7 You can’t make someone else’s choices. You shouldn’t let someone else make yours. ; and #10 Remain calm be kind. What’s beautiful about this book is that the 13 are given at the very beginning of the book, the remainder of the book is told as a series of stories that are examples of the 13 but aren’t enumerated as such. Thus the book is not a prescription so much as it is a loose set of guidelines for persons in leadership in any arena. Powell is at his best telling stories in lieu of being formulaic in his approach, which I feel is typical of books of this genre. What happened to me as I read the stories, I felt almost as though I were listening to him tell them instead of reading them. For example in regards to coming in new and taking over as the leader over a group of people Powell says: “start out trusting the people there unless you have real evidence not to. If you trust them they will trust you, and those bonds will strengthen over time.” I would nod my head in agreement. What are some of these stories? One of my favorites was near the end of the book in which Powell talks about some Brazilian exchange students, participating in the State Department’s Youth Ambassador’s program. Meeting with these students before their departure home, they tell them about their visit to a Chicago restaurant in which they didn’t have enough money to cover their bill. The restaurant manager picked up the bill and thanked them for coming to the restaurant and wished them well during their stay in America. The students were overwhelmed by the kindness shown to them as was Powell. He ends the chapter by talking about how it was the people, not the congressmen and members of the cabinet these students met who were America’s best ambassadors. What was the biggest takeaway from the book? That leadership in Powell’s view comes down to thirteen concepts, but at th end of the day, for him is about service to those above, below and around you. What Powell speaks of is what worked for him as a leader. I’m inclined to think that his approach would work for anyone in a position of leadership. If you’d like to learn more and get a fresh perspective on leadership, I highly recommend It Worked For Me.